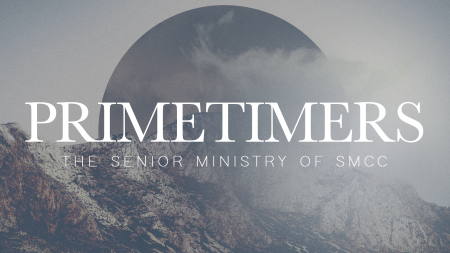 “Primetimers” is the name of SMCC’s Senior Adult Ministry. This fun group welcomes senior adults who are in the “second half of their first century” of life (50 years of age and up). Our ultimate desire is to honor our Savior, Jesus Christ and God’s holy Word in everything we do. Meetings are held on the second Friday of each month in the Chapel; our next meeting will be Friday, May 10. Fellowship and refreshments begin at 10:00am, followed by an interesting program geared to promoting Primetimer goals. Attendees enjoy a delicious lunch served at a very reasonable cost. Guests are always welcome whatever their church affiliation. Reservations should be made no later than the Wednesday before the meeting. To make a reservation call our Welcome Center at 978-6000; the $5 lunch cost will be collected at the door. September 13 Katherine Heinzerling & Tracy Hipps/C.S.M. From time to time, trips to cities and sights of interest are planned. These vary in duration from overnight to week-long. Travel by motor coach is arranged through a travel agency. Those who have participated remember these trips as memorable life experiences full of fellowship, inspiration and encouragement. For more information, call the church office at 978-6000.